Pastor Booker was called into the ministry in 1977 and Superintendent Edward Booker guided Pastor Robert Booker in his ministry and that experience has helped him in his administration at Zion Temple. After the passing of our founder, Supt. Edward Booker in 1982, he was appointed pastor by the late Bishop E. Lenox in July, 1982. Pastor Booker is a progressive man. He had a vision for the church and is currently working toward establishing our life changing center through our community organization, Zion Community Development Corporation. He is actively putting together a program for the community focusing on enrichment and development of our youth. 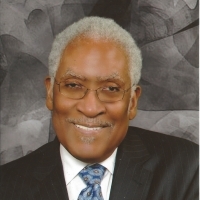 Pastor Booker has been a member of the Church of God in Christ, Inc., all of his life. He has served in various capacities: Locally, he has served as Deacon, Teacher, Trustee, Sunday School Superintendent, Choir Director, Minister of Music, and President of the Trustee Board. In the District he served as, YPWW President, Superintendent of Sunday School, District Minister of Music, Assistant Superintendent, 2nd Assistant Superintendent, and Financial Officer. For the Jurisdiction, he served as Budget Director (Southern Illinois Diocese), Chief Financial Officer, Member of the Board of Directors, Member of the Finance Committee, and Member of the Budget Committee (First Jurisdiction Illinois).